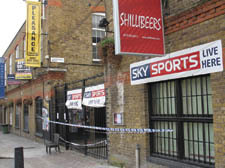 ISLINGTON Police have called for a review into the licence of Shillibeers – the bar where 16-year-old Ben Kinsella spent his last night out with friends. The venue, which is licensed to serve alcohol until 2am at weekends, does allow under-18s inside but 14-year-olds and under must be accompanied by an adult. Since January 2006 Islington Council has investigated seven noise complaints about the venue.